The reform has been pending in the Security Council for decades; and in order to maintain the world and to work balancing together -- the time has now come to reform. UN Security Council reform should be a deadline; it is urgent and important task. We should aim to improve the UN Security Council during the current 70th session. India's claim for permanent membership of the Security Council, the Prime Minister said that the world's largest democracy has a right to get a permanent seat in the Security Council. The Prime Minister also spoke of other members of the group. He said, "the world's largest democracies, the major engines of the global economy and the voice of all continents should be reckoned in the UN Security Council." The Prime Minister said that today the world has changed. The climate change, the terrorism, the poverty are many challenges facing the world. The peace and the security both are now the most important issue. Modi said the globalization is affecting the lives of everybody today. Everyone should get the benefit of development. India, Japan, Brazil and Germany are the participants in the G-4 summits. India is asserting to early reform in the UN Security Council. This summit in the year 2004 was held and India is hosting now it. 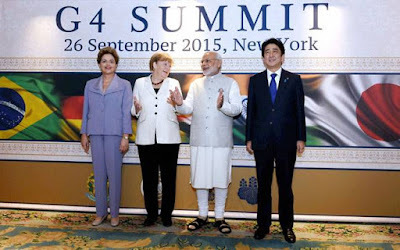 The Prime Minister Narendra Modi, German Chancellor, Angela Markel, President of Brazil, Dilma Rousseff and the prime minister of Japan, Shinzo Abe — all are participating in the summit. President of Brazil, Dilma Rousseff, The German Chancellor, Angela Morkel and the prime minister of Japan, Shinzo Abe put their views too. President of Brazil Dilma Rousseff underlined the need of early reform in the world organization. The 4 most important countries, the G-4, for the purpose of reformation in the council, were constituted. 15 countries in the UNSC reform and expansion are very important. When the global body was formed, it consisted of only 51 countries, but its membership has now increased to 193. The UNSC, only once between 1963 and 1965, was expanded. The number of non-permanent members had been passed to increase from 11 to 15.